Sankata Hara Chaturthi comes on every 4th day after Full Moon of Hindu lunar calendar month. It is widely believed that observing Sankata Hara Chaturthi will bring prosperity, happiness and fulfillment of desires. 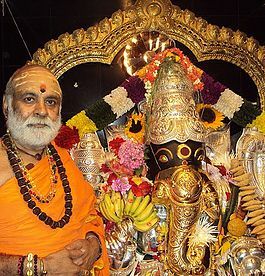 Kalasa Pooja, Maha Sankalpam , Ganapathi Abhishekam, Prahara Utsavam, Aarathi, Prasadam. Sponsor names will be included in Maha Sankalpam and Maha Prasadam wil be sent by Mail.